Gold closed at $1,670.6 yesterday after a weakening euro caused it to slip, however, it is still on track for its second weekly rise. This morning, the metal is edging up slightly as investors await the end of the Chinese New Year holiday period to see whether it can break out of its recent trading range of $1,660-1,680. Pre-holiday buying in China has been helping to push prices slightly higher and solid economic data from the world's second largest economy has made Chinese equities more attractive, along with other global stocks. Demand for the US dollar was boosted yesterday as ECB concerns over the euros recent strength worried the investing community. In turn that easily spilled into the energy complex, sending US crude oil prices $0.94 down to $95.86 per barrel. A slightly weaker-than-expected figure for the weekly US jobless claims also put downside pressure on crude oil. Gold continues to trade in a narrow range on signs of an improving global economy. The precious metal moved just below the resistance at $1,680 during intra-day trading yesterday but slipped back a little to close at $1,676.8, an overall gain of $4.1. Today all eyes are on the outcome of a European Central Bank meeting, where Draghi may voice his concerns about an overvalued euro. Many think that this would lead to a rise in gold if the economy hasn't bottomed out and measures to weaken the currency are likely to taken. The US released its weekly crude oil inventories report yesterday, showing a build of 2.6 million barrels, which was roughly in line with the estimates. After an initial drop, WTI crude rebounded towards the close, ending just $0.20 higher at $96.78. The energy complex will be closely watching the ECB meeting since Europe is perceived as the main risk for any economic recovery in the US. Gold closed pretty flat yesterday, settling at $1,672.7, as it failed to sustain Tuesday's rise after stronger than expected earnings led US stocks to rise. Whilst financial spread trading investors are still including gold as part of their portfolios, waiting for it to break out of its sideways trading, the climate of improving key economies is also tempting them into equities. Service industry data from the US, although down from the previous month, was slightly better-than-expected, spurring optimism in the energy sector. Also helped by a recovery in equities and a renewed weakening of the US dollar, the price of US crude oil recouped some of the previous day's losses, finishing $0.53 up at $96.62 a barrel. Commodity investors are still waiting for the catalyst that will cause gold to break out of the $1,660-1,680 range that it's been trapped in since last week. Yesterday, the precious metal closed $6.7 higher at $1,674 and, given the recent price movements, some are wondering whether the momentum is running out after a twelve year rally. Investors are eagerly looking at any new figures from the US to gauge the health of the world's largest economy and, more importantly, determine whether quantitative easing will continue. Loose monetary policy was a key driver in gold's rally over the past few years and many are concerned that an improving US economy will discourage the Fed from continuing with its current bond buying plans. Crude prices followed stock markets lower yesterday, losing $1.58 to $96.08 a barrel, with extra downside pressure coming from a rebounding US dollar. The headlines and uncertainty regarding the European political arena helped remind everyone that the sovereign risk from this side of the Atlantic is still present. Gold closed at $1,667.3 on Friday and many now expect it to trade in a narrow range between $1,660 and $1,680 as upbeat data in the US takes the edge off the metals shine. The world's largest economy has gained some traction and other good news across key economies has meant that the case for monetary stimulus has weakened. Accordingly, demand for the precious metal as a hedge against inflation has fallen and its safe haven appeal has taken a knock. Nevertheless, the gold market is edging slightly higher this morning. After China confirmed that its economic recovery is on course, Friday's US employment report also pleased energy investors. So, with the two biggest oil consumers staying strong, crude prices were well supported and Nymex gained $0.24 to $97.62 a barrel. Given the current unrest in North Africa and the Middle East, the outlook for crude oil remains positive. Fear of inflation is off the table for now and this affected gold prices as a hedge. In addition, there is an overall cautious optimism that the worst might just be behind us, which in turn pushed equities to recent year highs. This positive sentiment added downward pressure to gold yesterday, and so the metal finished $12 lower at $1,663.2. Awaiting the US Non-Farm Payrolls data, commodity spread trading investors took some profits off the table yesterday, sending WTI crude oil $0.56 down to $97.36 a barrel. However, the growing unrest in the Middle East and North Africa shows no sign of abating which should offer further support for the energy markets. From a technical analysis perspective, the crude oil chart indicates a steady uptrend since mid-December, but one might ask whether a negative surprise in the US employment figures could interrupt that. Gold closed at $1,676 yesterday, up $13.2, as US GDP unexpectedly shrank in the fourth quarter of 2012. This encouraged investors to flock back into the traditional safe haven and this morning the metal is edging towards its highest level for a week. Signs of recovery in the Eurozone and an expected weakening of the dollar as the Fed continues to buy bonds is also supporting the precious metal. Despite a larger-than-expected build in US weekly crude oil inventories, the price of US crude actually moved up by $0.45 to $97.76, even posting a brief trip above $98.00. The energy markets were encouraged by more of the status quo in Ben Bernanke's speech as he promised to keep buying assets to boost the economy. Reports of an Israeli attack near Syria's border with Lebanon may have also added a certain amount of risk premium. In gold spread trading, as we approached the support around the $1,640 level, bargain hunters came back into the precious metal and so we saw a rebound of $8.8 to $1,663.1. Also, reports that the central banks in Russia and Kazakhstan had recently increased their gold holdings signalled that buying on the dips is still being considered by the big players. Although in line with the estimates, the Case-Schiller property index painted a positive picture of the US housing sector, which in turn supported demand for crude oil. That renewed optimism pushed US crude $0.86 higher to $97.30, a four month high. In addition, the current social unrest in Egypt added another bullish feature. The gold market closed at $1,654.1 yesterday after a slight decline of just under $5. Today the precious metal appears to be edging higher as bargain hunters buy whilst it's at its lowest level for more than two weeks. Having said that, investors are still exercising some caution ahead of today's Fed meeting which will discuss monetary policy in the world's largest economy. Signs of US recovery have been pretty strong recently so investors have been tempted to add riskier assets such as shares to their portfolio. For the energy markets, a better-than-expected climb for US durable goods orders overturned disappointing numbers for pending home sales. As a result, WTI crude moved up by $0.53 to $96.52. At the same time, the announcement that a New Jersey refinery will be shut helped boost the crude oil spread trading markets. Gold closed at $1,658.9 on Friday, and is little changed today, with the improving global economy keeping the market near the two-week low it hit during the previous session. The current climate of optimism has taken the shine off gold's safe haven appeal as online spread trading investors' appetite for riskier assets increases. Interestingly, the precious metal dropped by around 1.5% last week, its sharpest weekly drop in a month. Nevertheless, international bankers and finance ministers warned that even though the euro has stabilised, the Eurozone could still take years to recover. 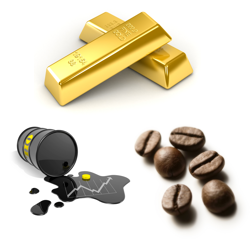 This means that gold will remain an attractive asset to many over the longer-term. US crude oil closed marginally higher on Friday at $96.00 as energy market participants remained optimistic about the US economy, which in turn should support oil demand. The fact that there was no profit taking going into the weekend after trading at a four month high could suggest some strong confidence going forward.